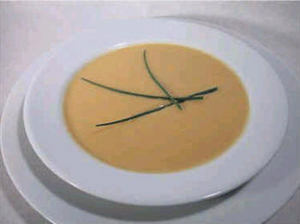 Cream of Garlic Soup is one of the signature dishes at Chef Susan Spicer's wonderful French Quarter restaurant Bayona. This is rumored to be that signature recipe. In a 4-quart, heavy-bottomed pot, sauti the onions and garlic in the butter and oil. Stir frequently over low to medium heat until the onions are a deep golden brown, about 30 minutes. Add the chicken broth and bouquet garni and bring to a boil. Stir in the bread cubes and simmer for 10 minutes, until the bread is soft. Remove the bouquet garni and purie the soup in a blender, carefully! Remember that hot liquids can splash up in a blender. You can also use one of those hand-held blenders and purie it right in the pot if you like. Strain the soup through a medium strainer, reheat and whisk in more chicken broth if the soup is too thick for your taste. Add the half and half, then season to taste with salt and pepper.